The recipe serves 4 and keeps for 3 days when refrigerated in a sealed container. Soak the cashew nuts in water for 2 hours, then drain and rinse. Gently melt the cacao butter over a low heat. 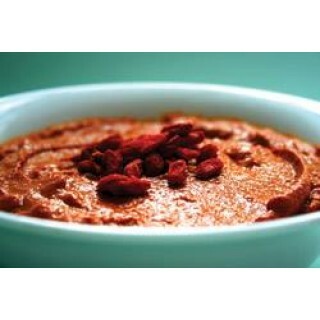 Soak the goji berries in water for 5 minutes to soften them enough for blending. 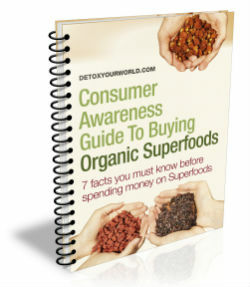 Drain them from the water (TIP – Keep this water as you can drink this for later. It has a lovely subtle honey taste to it). Add all the ingredients to a high powered blender and blend until smooth and creamy. 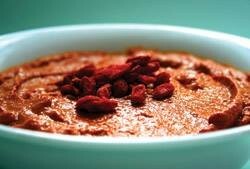 Serve in bowls, topped with extra goji berries.